The Windows Phone 8 Emulator uses the HTTP proxy settings from the host computer. If you can’t access Internet resources from the emulator, check with your IT administrator to make sure that your proxy settings will work with the emulator. If your network’s proxy servers are unavailable or malfunctioning, it might be possible to restore connectivity for the emulator by disabling automatic proxy detection on the host computer. However this only works in certain network configurations. For troubleshooting info, see How to connect to a local web service from the Windows Phone 8 Emulator. The Windows Phone 8 Emulator appears on the network as a separate device with its own IP address. It is not joined to a Windows domain and it does not share domain or workgroup credentials with the host computer. If your network requires domain or workgroup authorization for basic network and Internet connectivity, contact your IT administrator for an exception. This exception allows your development computer to serve as a boundary machine and to accept connections from non-domain-joined network devices like the emulator. The Windows Phone 8 Emulator also uses its own set of MAC addresses. If you can’t access network or Internet resources from the emulator, check with your IT administrator to make sure that the emulator’s MAC addresses have been authorized on your network. On the emulator toolbar, click the chevron button (>>) to open the Additional Tools window. In the Additional Tools window, click the Network tab. On the Network page, locate the Physical address entries. DHCP. The emulator requires DHCP because it configures itself as a separate device on the network with its own IP address. Automatically configured DNS and gateway settings. It’s not possible to configure DNS and gateway settings manually for the emulator. If your network requires manually configured settings, check with your IT administrator to determine how you can enable network connectivity for the emulator. Under certain conditions, the emulator takes several minutes to start or fails to start due to a timeout. When the emulator fails to start, you see the following message: App deployment failed. Please try again. Running the Windows Phone 8 Emulator from a bootable VHD. This configuration is not supported. A faulty hard drive. Consider running the chkdsk program. A hard drive that needs to be defragmented. Consider defragmenting the drive. A hard drive that is almost full. Check the space available on the drive. A hard drive that is slowed by a large number of read requests from other running applications. Reduce the number of applications that are accessing the disk. Not enough memory is available because of other running applications. Reduce the number of applications that are consuming memory or increase the amount of memory. Generally, any factor that is contributing to poor performance on the system. Begin troubleshooting with the component that has the lowest subscore in the Windows Experience Index, which you can find on the Performance Information and Tools page of Control Panel. Virtualization software other than Hyper-V.
Antivirus applications that hook into the network stack. Network monitoring or logging tools. To ensure that these other applications don’t interfere with the emulator, you may have to reconfigure the Hyper-V virtual adapter used by the emulator. After you uninstall applications of these types, you may also have to recreate the Hyper-V virtual switch used by the emulator. 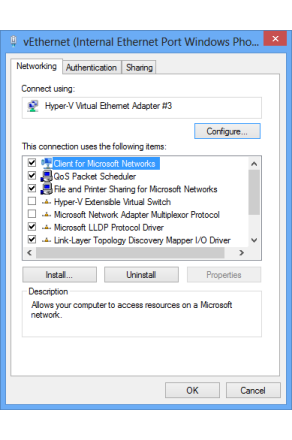 The following screenshot shows the virtual adapter used by Hyper-V with the emulator as it typically appears in the Network Connections window. Open the Network Connections window by finding and running View network connections from the Windows Start screen. This option appears under Settings. In the Network Connections window, right-click on the adapter named vEthernet (Internal Ethernet Port Windows Phone Emulator Internal Switch) and select Properties. In the Properties window, in the list of items used by the virtual adapter, make sure that only the following items are checked. All other items should not be checked. The following screenshot shows the properties of the virtual adapter. Note that the entire list of items is not visible. Repeat these steps if you uninstall and reinstall the emulator, or install other networking software or drivers. In Hyper-V Manager, in the navigation pane, select your development computer. From the Actions pane, run Virtual Switch Manager. In Virtual Switch Manager, create a new virtual switch of type Internal. 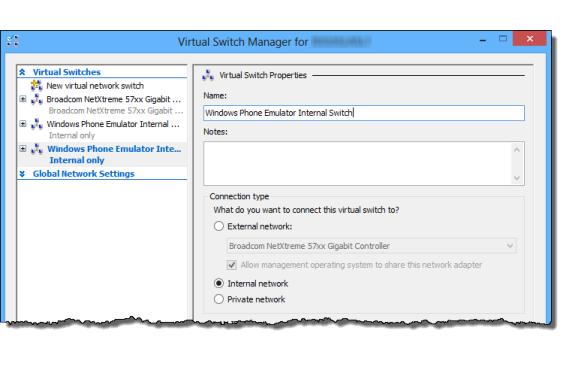 In the Virtual Switch Properties window, name the new virtual switch Windows Phone Emulator Internal Switch and set its connection type to Internal network. Click OK to close Virtual Switch Manager. You can also close Hyper-V Manager. For more info about troubleshooting the Windows Phone 8 Emulator, see (WP8) Emulator (XDE) Troubleshooting Tips.